What is Profitable Prospecting Mindset? Sales Call Reluctance is the emotional hesitation to prospect and self-promote. It is a fear that salespeople experience when it is time to proactively initiate contact with potential buyers. Fear is a mental response to a perceived threat. An average salesperson needs to have at least 10-12 appointments a week in order to achieve their goals. Prospecting is paramount to their success. It is not an intellectual exercise to prospect. It is an emotional exercise. The majority of salespeople suffer from Sales Call Reluctance from time-to-time or every day. The solution to Sales Call Reluctance is Thought Realignment. Meaning that a salesperson must embody (with every fiber of their body) a mindset that drives their prospecting behavior that drives their results. Profitable Prospecting Mindset is a reconciliation within a salesperson that prospecting is a fundamental core competency for successful selling. They have no resistance toward the activity. They prioritize prospecting. They understand the value of their product/service. They understand the impact their product/service has on their prospect’s business or family. They have a personal vision that is greater than any discomfort. Their vision magnetizes them through the ups and downs of prospecting. They are emotionally resilient. They are 100% present and want to succeed, however, they emotionally detach from the outcome. They do not agonize over what they cannot control. Salespeople cannot control their prospect’s reactions or responses. They can only control how many people they initiate contact with on a daily basis. Assess your call reluctance (invest in the assessment so you can come to terms with your lack of profitable prospecting.) Call Connie at 602-997-1101. Admit that call reluctance is costing you big bucks. Apply proven techniques to realign your thinking so that you can prospect with emotional resiliency. Many salespeople have read all the books, listened to all the CDs, attended all the webinars and they are still not achieving their goals. Sometimes salespeople think they are experiencing Sales Call Reluctance, however, they are actually suffering from a Low Goal or Low Motivation Imposter. Low Motivation Imposter means that they do not have the physical or psychological energy to prospect and they are short of “can do.” They do not have enough gas in their gas tank or juice in their battery to prospect. It’s important to find out what is really going on so that they can stop the superficial “band-aids” to their performance issue. Once they are courageous enough to take an assessment, and if they can come to grips with what is at the core of their performance issue, they can find their way forward. Sometimes I encourage my clients to seek medical treatment due to low motivation scores. One gentleman shared that his doctor had never seen such low testosterone scores. He was able to get on track physically so he had enough energy to prospect and sell. SPQ Gold Assessment is the only assessment in the world that measures Sales Call Reluctance and the Imposters. It is used for pre-hire and also for training and development. Want to feel better immediately about yourself? As salespeople if we are active in our marketplace every day we’ll have some type of challenge or obstacle; right? How can you ensure that you’ll keep yourself in a good psychological place no matter what challenge arises? I encourage my clients to start every day, seven days a week, writing down five things that they are deeply grateful for. At first they are grateful for their family, their health, their house, etc. However, as the days progress, they start recognizing the small things that they appreciate and their confidence soars, e.g. for the resource a friend shared, for a thoughtful compliment their client gave them, for their discipline to make a few cold calls. Gratitude creates a magnetic energy. Try it! I guarantee you’ll feel better. Feeling good about you is vital to your success. Whether you know it or not, you radiate your feelings. You cannot not fake it. Your prospects pick up on your energy and your tone. You don’t even have to say a word. End your day with writing down five achievements for the day. Salespeople do not stop to celebrate their achievements unless they is are grand slams, so to speak. Recognizing and acknowleding your achievements will create a new energy for you. I guarantee this also! If you don’t feel better about you after doing this for a week, please contact me. I’ll send you a $20 Starbucks gift card so that you can go have a cafe latte and contemplate your world. Posted on November 18, 2011 Categories Sales Call Reluctance, Sales Prospecting Success, Sales Success, SPQ Gold, Success HabitsLeave a comment on Want to feel better immediately about yourself? Is Sales Prospecting Your Weakest Link? It happens time and time again . . . another veteran salesperson admits that he is uncomfortable with prospecting. Chris has been selling for over 25 years with credible tech companies in the role of an account manager. He shared that once he is face-to-face with a prospect that he has a high close rate — 70%. He “hates” prospecting and he is experiencing mediocre success — self-doubt and fear have set in. His old strategies are not working in this economic environment. Sales Call Reluctance is the emotional hesitation to prospect and self-promote. Prospecting is an emotional exercise. It takes emotional intelligence and stability to prospect consistently. The good news for Chris is that suffering from Sales Call Reluctance is nothing to be embarrassed about, living with it needlessly is. Addressing call reluctance starts with proper diagnosis. You need to take an assessment that specifically measures Sales Call Reluctance. It’s like taking an MRI of your sales prospecting skills and abilities. Once properly diagnosed, you can move forward with confidence and a prescription that is specifically designed for the type(s) of call reluctance you suffer from. There is light at the end of the tunnel! In addition to addressing call reluctance, creating, articulating and living your laser-sharp Value Proposition is vital for your prospecting success. When you can recognize your intrinsic value and the value of your products/services, you will develop the emotional stability to move forward with confidence. You can repair your chain and become a strong and confident salesperson who prospects consistently. Choice, Change and Connection are what will move you forward. Posted on July 12, 2010 Categories Cold Calling, Sales Assessment Testing, Sales Call Reluctance, Sales Prospecting Success, Sales Success, SPQ GoldLeave a comment on Is Sales Prospecting Your Weakest Link? What causes cold call reluctance? Most cases of cold call reluctance are simply because a salespeople needs to do some internal and external homework! If you have truly done your homework and know who your ideal prospect is and what problem you solve for them. . . you will be calling into your ideal target market. Seriously. Then you can say "We work with several companies similar to yours. . . " One component of "Influence" is establishing commonality. You can warm up a "cold" call fast. The "comment" link is below — it's a little small — but it's there! Please comment and share your thoughts and feelings!!! Posted on April 16, 2010 Categories Cold Calling, Sales Call Reluctance, Sales Prospecting Success, Sales Success, SPQ GoldTags cold call reluctance, prospecting tips, Sales Call ReluctanceLeave a comment on What causes cold call reluctance? Connie Kadansky: Are you reluctant to make a cold call? You're sitting in your office after promising yourself yesterday that you would start making cold calls today . . . and you reach for the phone and you stop. . . you suddenly remember you need to make a dental appointment, then you remember your dog is overdue for grooming, then it hits you that your spouse's birthday is in two weeks and you need to buy a present. Yes, you are avoiding making your calls. 2. Make sure that both of your feet are on the floor as you close your eyes and take a second deep breath. 3. Think of a current client/customer who really believes in you and you are part of their inner circle. Keep thinking of them until a smile comes across your face. 4. What is the value you provide for this client/customer? What do they say about your products/services? Be specific. Ease yourself into allowing yourself to recognize your value. Jot down the key points. 5. Pick up the phone with the thought of this client/customer in your mind and that you are simply going to find your next client/customer. You can re-train your brain to prospect consistently. Call Sales Call Reluctance Coach Connie at 602-997-1101 today or email her at connie@exceptionalsales.com. She will help you help yourself. Connie helps you solve your own cold call challenges. 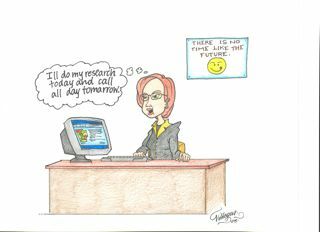 Posted on February 15, 2010 Categories Cold Calling, Sales Call Reluctance, Sales Prospecting Success, Sales Success, SPQ GoldTags Cold Calling, reluctant, sales call, Sales Call Reluctance, sales coachLeave a comment on Connie Kadansky: Are you reluctant to make a cold call? SPQ*Gold, the only assessment in the world that measures Sales Call Reluctance, won Best in Class from Management Recruiter International network of executive search firm owners. SPQ*Gold is used worldwide in selection of salespeople who must prospect or they will fail. It is also used worldwide in training and development of salespeople. For help in making sure you are hiring salespeole who will prospect and also in training and developing your current salespeople, call Connie at 602-997-1101, email her at connie@exceptionalsales.com. Take the guesswork out of hiring salespeople, financial advisors and executive recruiters. A veteran salesperson who is highly respected in his industry called last week and admitted to experiencing Sales Call Reluctance. He knows that despite his sales success, his bank account could be much more exciting if he overcame his Sales Call Reluctance. Because he is motivated and goal oriented and he knows his industry inside and out, we were able to get down to the nitty gritty in short order. Sales Call Reluctance is the emotional hesitation to initiate contact with prospective buyers on a consistent basis. Prospecting is not an intellectual exercise. It is an emotional exercise and Sales Call Reluctance is an emotional interference. My question to him was: "When you are in your office and you reach for the phone and you stop, what is it that is causing you to stop?" He replied slowly, "what do you mean, what causes me to stop?" That is a normal reply of most people who experience call reluctance. They are so trapped in their fear, that they do not stop to consider what their thoughts are at that very moment. My question to you my dear reader is: When you reach for the phone to prospect and you stop and swing around to check email one more time, or check the stock market — in essence when you avoid prospecting — what is the thought that is causing you to stop? Until you identify the thought or "negative intruder" you will not be able to address your call reluctance. All the tricks, such as "think positive," "remember your past achievements," "relax" will not be sustainable over time. With a little coaxing, the veteran salesman, said "I don’t know what to say." Yeah! Victory! He has identified at least one negative intruder that is causing him to NOT prospect. This is the first step in overcoming Sales Call Reluctance. To overcome Sales Call Reluctance you have to be a realist and attack your negative intruders headon. Write down your negative intruders. Your freedom is in capturing them on paper. Then you can do something about them. My goal as a coach/trainer for salespeople is NOT to have you LOVE prospecting. The goal is to get you neutral about prospecting. When you get neutral, not hating it or loving it — you are well on your way to consistent prospecting that will produce sales results. Is it REALLY possible to overcome Sales Call Reluctance? A sales manager asked me the other day in the most sincere tone of voice "is it truly possible for a salesperson to overcome Sales Call Reluctance?" It was evident that he had his doubts. He was right. Call Reluctance is a complex, perplexing problem. It is not as simple as most sales managers want to make it by saying "just pick up the #$()@#* phone." My sincere answer to him was "yes, it is possible IF the salesperson goes through the four steps to overcome Sales Call Reluctance with a coach/trainer/manager who truly understands Call Reluctance." 1) They must be aware of their call reluctance. Call reluctance shows up first in the commission checks and second in the appointment calendars. How happy are they with their commission checks? How many appointments do they have this week with NEW prospects? There is no better indication of call reluctance than checks and calendars. If the salesperson is not willing to be honest with themselves and are confused about this first step, they are most likely NOT going to address their call reluctance issue. 2) They must assess their call reluctance. The only way to truly assess Sales Call Reluctance is to take the SPQ*Gold assessment, the only assessment in the world that is validated through psychometric methodology that measures the 12 types of Sales Call Reluctance. They will find out what kind of call reluctance they suffer from and to what intensity. Some types of Call Reluctance are more easily overcome than others. For example, Telephobia is relatively easy to overcome, as well as Referral Aversion. However, Yielder and Overpreparer Call Reluctance are more difficult and take longer to overcome. Precise Diagnosis is the KEY! 3) They must admit they have Call Reluctance, which is the emotional hesitation to initiate contact with prospective buyers on a consistent basis. Sometimes this is the most difficult step. If they have the courage to be honest and admit their Call Reluctance, the chances of them overcoming Sales Call Reluctance is entirely possible. If they half-heartedly pay lip service, forget it, they are fooling themselves and until they get out of the illusion, any investment to train or coach them may be for naught. 4) They must be willing and motivated to apply proven techniques in overcoming Sales Call Reluctance. These techniques or prescriptions were researched and developed by behavioral scientists George Dudley and Shannon Goodson. The prescriptions are designed for particular types of call reluctance. One prescription does not work for everyone. If the wrong prescription is prescribed, it can actually make someone’s Call Reluctance worse. Different prescriptions are prescribed for different types of Call Reluctance. Once people have gone through these four steps, they will be able to free themselves and start earning what they are worth! Question: Why is it that salespeople want to hide and deny their call reluctance? What are they afraid of? Posted on October 16, 2007 Categories Sales Call Reluctance, SPQ GoldLeave a comment on Is it REALLY possible to overcome Sales Call Reluctance? Did you know that the SPQ*Gold Assessment developed by George Dudley and Shannon Goodson is the only assessment in the world that measures Sales Call Reluctance? This assessment has 21 different measurements and "telephobia" is only one of the 12 types of call reluctance. Have you ever hired a call reluctance salesperson? What was your experience?